Dad described the Bernardo’s file on Grace and Alice, sparse, and it is. 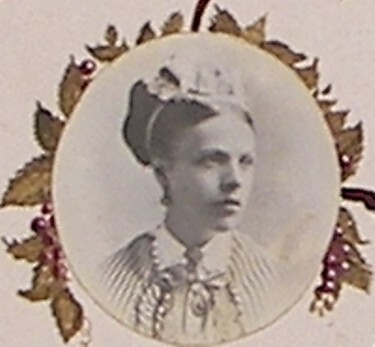 Their brother, John, had traveled with the Annie Macpherson organization when he was only 13. While not at the beginning of the sad movement of children for indentured service to Canada, Australia and other countries, it was early, in 1889. Grampa always spoke of his Dad and Grand Dad helping orphaned children and it does appear that John, after two placements and a number of years, accompanied two other groups of children with the organization, one time traveling with a friend (21), Arthur Wheeler. Arthur separated from John and traveled, instead, to Toronto and my research has turned up nothing but dead ends where he is concerned. Hmmm….this story is not about John, but about Grace. Alice is still a bit of a mystery. 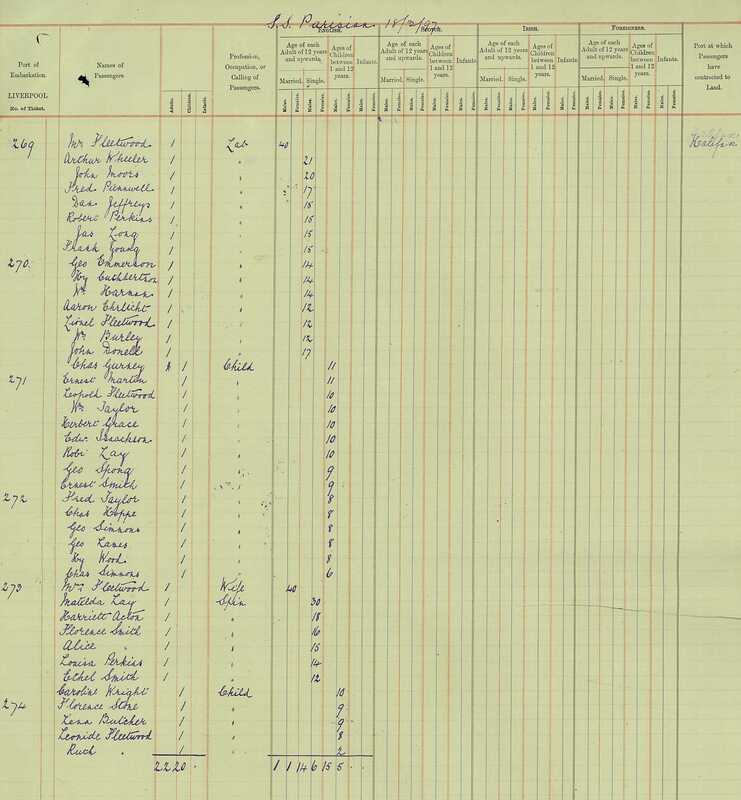 On John’s papers I learned of two placements for a Miss Moore, 39 Duke Street, Hamilton and 61 Robinson Street. 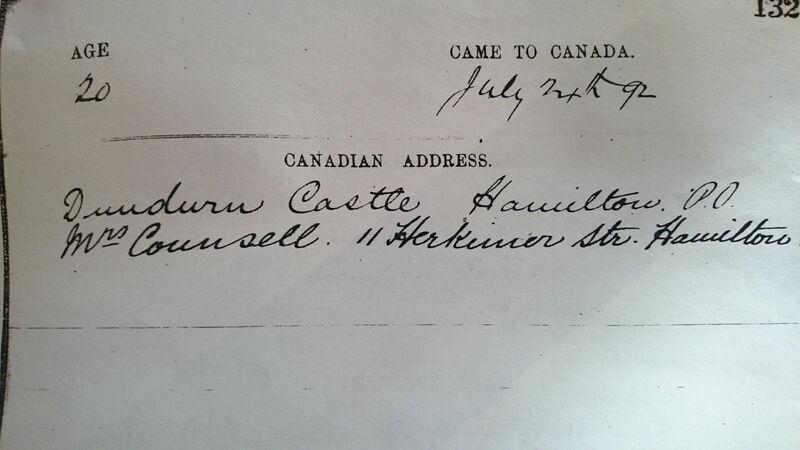 and then, later, a servant with Mrs. Counsell of 11 Herkimer Street in Hamilton, Ontario. Regarding all of these placements, I feel tremendous gratitude. In our study of the British Home Children, our group refers to domestics and servants in these positions as the ‘lucky ones’. First of all, Grace was twenty years old. If you look at the list of immigrants above, some of these children were as young as four and six. Some were emigrated without their parent’s knowledge. As my research and understanding opens up, I realize that I need to be grateful, however repulsed by the stories of so many others. I’ve just finished a book, a gift from my father, Laying the Children’s Ghosts to Rest: Canada’s Home Children in the West by Sean Arthur Joyce. 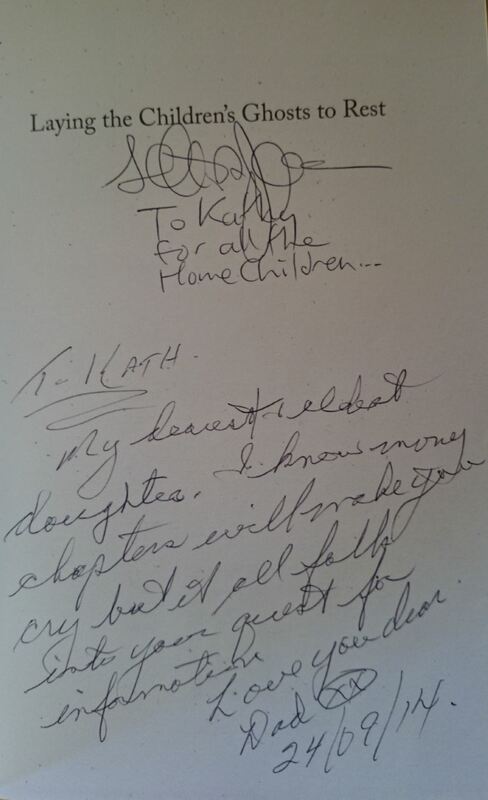 These and other books, as well as the dedicated work of such individuals as Lori Oschefski, Sandra Joyce and Karen Mahoney with the British Home Children Advocacy & Research Association have brought to light, bit by bit, a part of Canadian history that needs to be acknowledged and taught in schools. 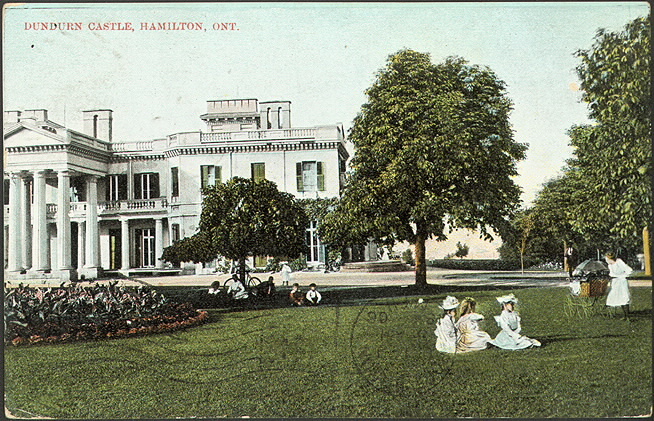 Grace is found in Dundurn Castle in Hamilton. 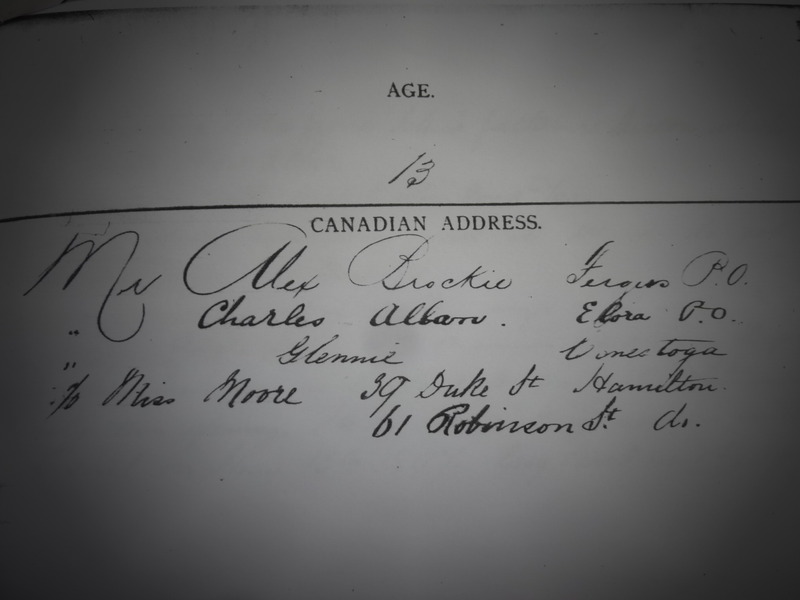 By 1892, the residents were no longer the famous Sir Allan MacNab, his second wife, Mary and their children. I am trying to locate names of the families (likely relatives) who continued to live in this famous tourist location. What’s interesting about such placements of domestics is that very little is written about their responsibilities or circumstances in the history books. These were the people who toiled for the comforts of the fortunate and yet it is difficult, in the rural placements especially, to ever find them on the census records. Few narratives endure. My father teases me and says that I can invent their stories, but you see, I will never write anything unless it is based on fact. Last night, I found a post written by Nancy, a freelance journalist and biographer on a quest to visit and write about all 266 National Historic sites in Ontario. Her blog, Silcox, provides for some insight into Grace’s story, in a post titled Upstairs/Downstairs: What the Butler saw at Dundurn Castle. An awesome post. See also, the Toronto Sun’s article…Ontario’s Downtown Abbey: Visiting Hamilton’s Dundurn Castle. Ironically, the low, odoriferous and dark basement where the MacNab’s complement of servants worked was surely cozier than the cavernous rooms above. It was no doubt tempting for the MacNab children to go below. “But they were forbidden to enter the servants’ quarters” Bridget says. In an effort to keep staff “hanky-panky” at bay, females slept in the servants’ quarters; males bunked down in one of the outbuildings. Woolen sox were advised between November and April! “But in most cases Dundurn’s servants were better off, working in much better living conditions than most of the working class in other domestic positions,” our excellent tour guide offers. “People criticized Alan MacNab for treating his servants too well.” She points out the painted wooden floors, windows and wallpaper throughout the servants’ quarters as testament to his enlightenment. In addition to 3 meals a day, and a roof over their heads, each of Dundurn’s servants got 3 glasses of ale daily. “But the cook, especially if she was valued, had unlimited ale. They wanted to keep her happy!” suggests Bridget. The large kitchen is the centre of Dundurn’s servant’s quarters. A massive wood-burning stove, with various doors and cubbies covers most of the kitchen wall. “The word ‘range’ comes from the notion that a whole range of foods, cooked at different temperatures, and for different lengths of time could be handled by these cook stoves,” says Bridget. She now points to a row of bells on the wall of the kitchen. “Each of them rings in a different tone. One tone was for the cook; another for the butler; another for the footmen. Staff soon learned what ring was for them.” A series of smaller rooms give clues to the never-ending chores of a 19th century servant. Bridget’s tour takes us past the candle-making room, the laundry, the brewery, the wine cellar, the root cellar, the food storage room and one devoted solely to luggage. “After all, when the MacNabs went to visit, it was by carriage and took a long time. So they needed to pack many clothes for at least a week or more.” Ladies’ maids handled all clothes preparation and packing. Of these circumstances, Bernardo’s records support both the location and the reality for Grace. 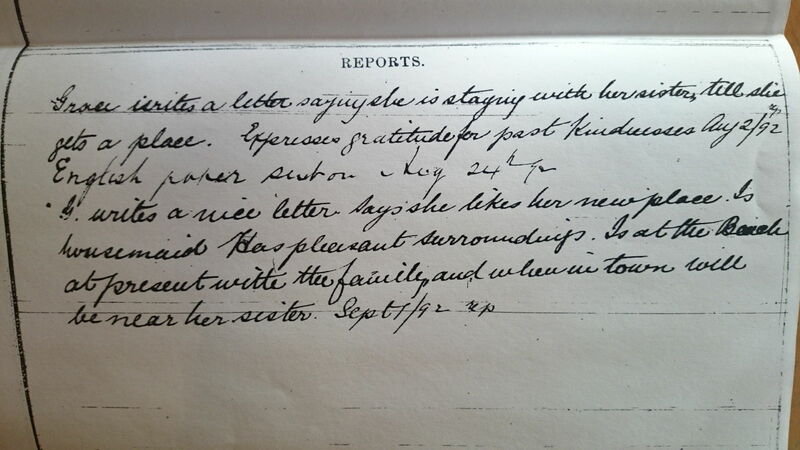 My quest for information will continue, but I wanted to touch, just briefly, on Mrs. Counsell of 11 Herkimer Street. 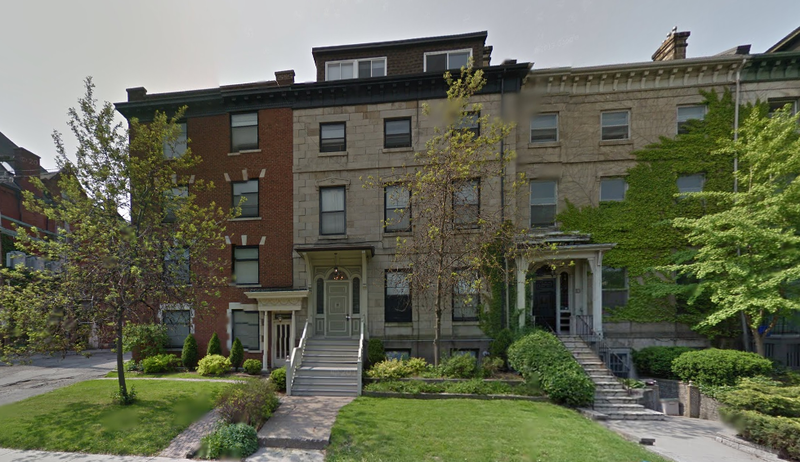 I find 18 year old E.M. Counsell, clerk for the Merchant’s Bank, living at 11 Herkimer Street and so, as the 1891 Hamilton census would suggest, Edward was living with his parents, Charles M. Counsell and Charlotte E. Counsell at the time, listed as a 17 year old. 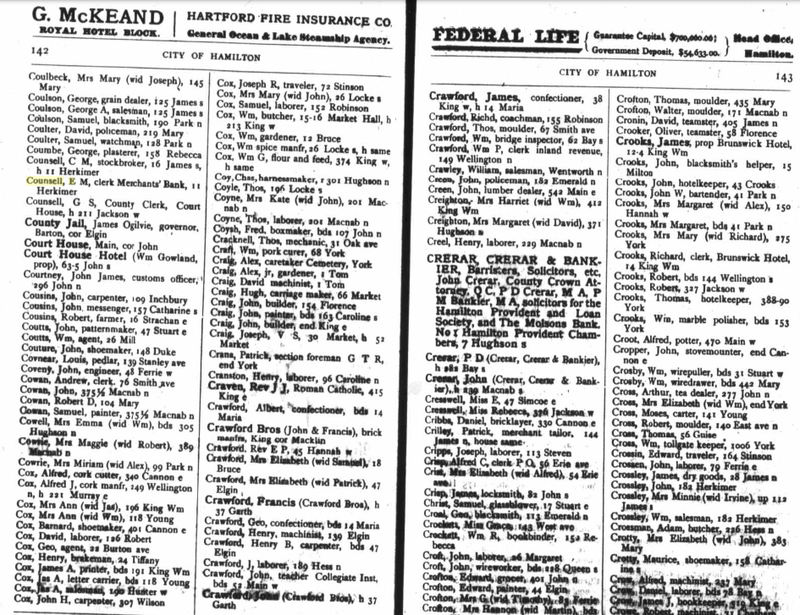 At the bottom of their records, it is evident that Charles and Charlotte have, in 1891, three domestics, John and Maggie Thompson and Tillie Hammond. 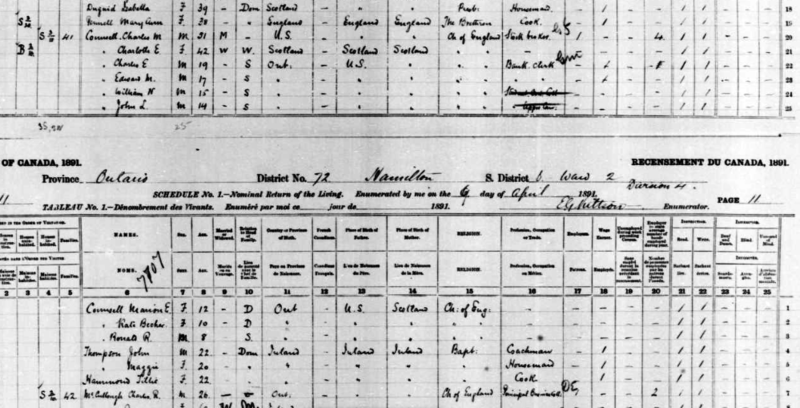 Grace would have followed behind them, although she does not appear on the 1901 census because she was living at home with her father, John Moors and family, immigrated 1898, many years after his own son, John. I find Charlotte widowed on the 1901 census (Charles death certificate reading 1900) and she lives in Hamilton for the remainder of her life until May 9, 1923. So, this is the Mrs. Counsell who had as her domestic, Grace Moors. And this is her home at 11 Herkimer, as it appears today. Amazing what worlds are opened up with a few pieces of information. As I watch The Midwives of Netflix or read my current list of books, I can not help but appreciate more and more the resilience of my ancestors for their struggles and their determination. I am proud to be a descendent, on my mother’s side, of the Acadians and on my father’s side, of the east side Londoners. I anticipate learning more as I continue my research. The second address, 61 Robinson Street, will be described in a new post.